Meet ten-year-old Loretta in our Easter family show Random Selfies. Performed on a digitally animated set, she explores what it feels like to grow up in the inner-city, from the school playground and new friends to the glossy world of social media. 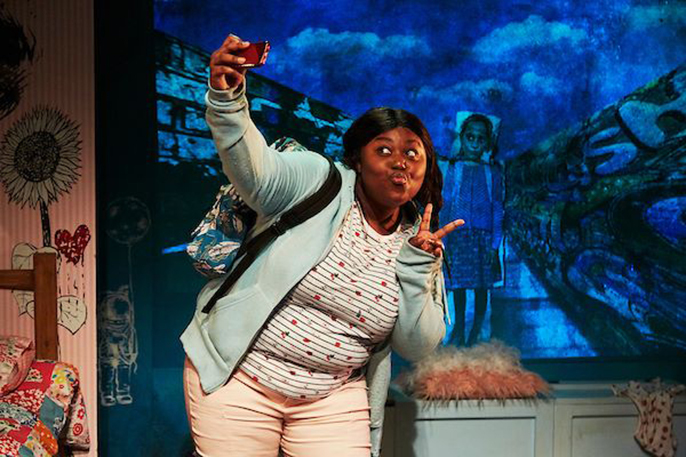 Written by Olivier award-winner Mike Kenny, Loretta takes you on a vivid journey into her imagination as she explores what it means to be lonely in a busy world. Performed on a digitally animated, Loretta is played by Christina Ngoyi who brilliantly conveys the sensitivities of self-discovery and loneliness. Family Saturday performances: 23, 30 Mar & 6 April at 2pm. As an Afridiziak subscriber enjoy a special offer to treat the whole family for just £20 (usually £34) for 2 adults, 2 children. Enter RANDOM20 when booking tickets online or calling 020 7582 7680. NEW TO KNOW: BOOK YOUR FAMILY THEATRE TRIP NOW | Ovalhouse is based in Oval, Kennington, SE11 5SW.